Note on Dudley Cemetery: Headstones are often missing from this cemetery. Many of the them were bulldozed into a gully by an oil company that leased the land for drilling. 1840, died 12 Jan 27. Private, served with Co. I, 4, USCHA (US Colored Heavy Artillery). The Application for Headstone gives the name of this cemetery as "Private, Green’s, near Carney." The stone was shipped to Rachael Bond / Bob Claypool. The 1920 census shows Enoch Bonds was born about 1840 in Tennessee, his wife Rachel about 1855 in Alabama. A photo of his headstone may be seen at okcemeteries. William Tillett: Here as above the cemetery name on the Application for Headstone is Green’s, but here it is miswritten as Greece. William Tillett served with Co. A, 98th Regt NY Inf. Born about 1844 in North Carolina, his wife was India Tillett, born TX abt 1872. The stone was sent to her at Carney, Rt 1. William died 16 May 1932. A photo of it may be seen at okcemeteries. 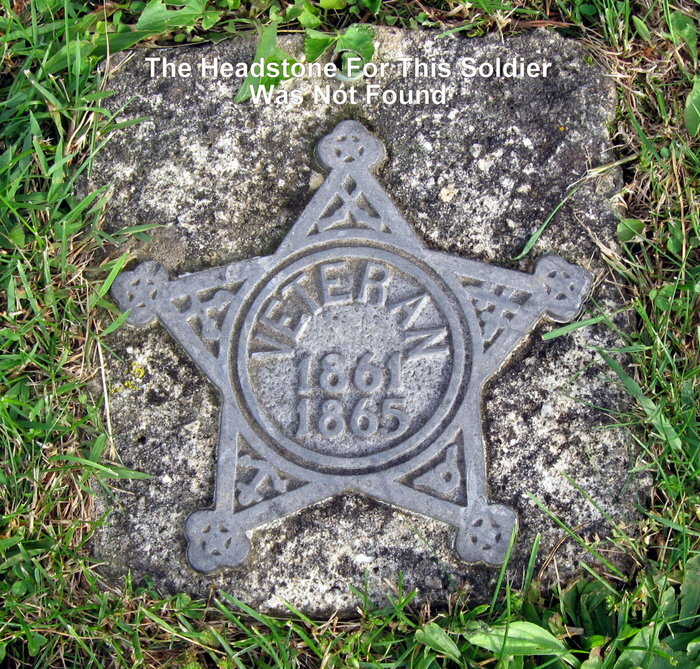 The Application for Headstone shows he served with "US Colored Troops, Co. A, 84th Reg." He died 30 March 1904. The stone was shipped to W. H. Tillett of Carney. Cemetery name give as "Greens," date of purchase 7 Apr 1928. Signed by W. H. Tillett (see above). William Tillett must have been friend or family. A photo of his headstone may be seen at okcemeteries. Anderson Fisher is known from an obit that appeared in the Carney Enterprise for 1 Jul 1905. He was born in 1843, died 28 June 1905. The records available show that he served in Co. F of the 63rd U.S Colored Infantry. He filed for a pension while living in Kansas in 1887. The record shows him an invalid and makes no mention of a wife. Other "Oten" Tate: Though born in 1808, on 25 January 1864 he enrolled at Memphis for a period of three years. Records report "Mustered into service on 1 Feb. 1864 at Memphis Tennessee" and "Discharged July 1865 at Vicksburg, Miss. for disability by order of Maj. Gen'l Canby." The date of his wife Patience's pension application suggests he died in late 1891. 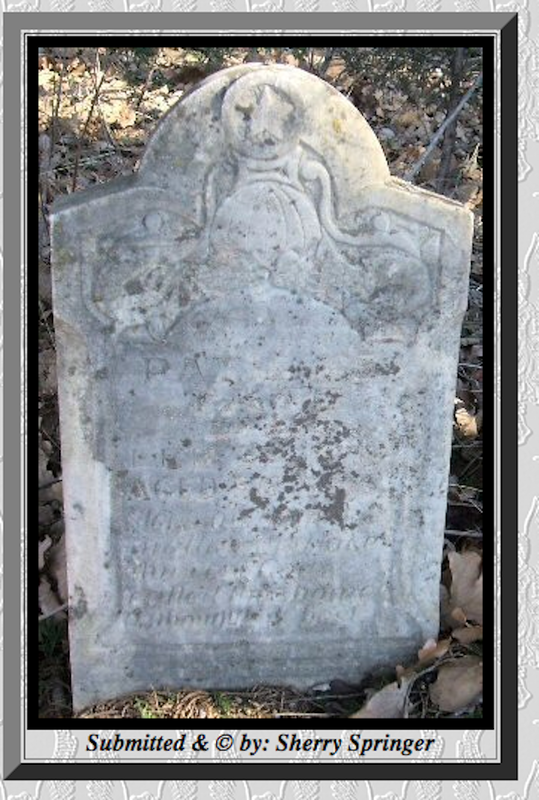 She died in 1910 at the age of 96, and her handsome stones appears here, courtesy of Sherry Springer of okcemeteries.net. She applied for a Civil War pension in January 1892 from Oklahoma. Shedrick "Shed" Taylor: Born 27 Feb 1843, Good Hope Plantation, Orangeburg County, SC. Died about 1940 near Dudley. Two Civil War enlistments are known. He enlisted in the U.S. Colored Troops, 84th Infantry Regiment, and then in Company G, U.S. Colored Troops, 87th Infantry Regiment. Rank at enlistment both times was corporal. According to the censuses, in 1870 he was living in Falls County TX; in 1880, in Anderson County SC: in 1900 in the black community of Luther, Oklahoma City County OK; and thereafter around Dudley, where he would remain the rest of his life. He had two wives, Nancy Snow and Julia (maiden name unknown), and a total of thirteen known children. At the end of his life he was living with his widowed daughter India, widow of William Tillett, a Civil war soldier also buried in Dudley Cemetery. Edmond Harrison: Born 1843, Carroll Co. Miss. 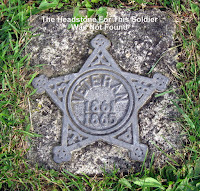 He enlisted there with the 49th United States Colored Infantry in 1864. Died 27 Oct 1899 near Sweet Home. Born Missouri, 1846. BLM shows homestead in section 35 of 15-3, right by the cemetery. The 1910 census gives his name as Dillard (“Dillon” comes from his Civil War record and grave marker), widowed. A son was Earnest A., married to Irena; step-granddaughter Loleen Tildero/Tilders. 1880 census shows him in Ottuma, Coffey, KS, with wife Hatty b. 1854; children Ida M., Effie, Dory A., and Mary A. Born in MO. In the Chandler News for March 1904 he’s named as a witness for the proving of Wade Westbrook’s claim in sec 28 of 15-3. In 1898 he was a witness for Jesse Lawson. (Another witness was Rufus Pitts.) He seems to have had a son of the same name or grandson who died in Los Banos, Merced CA 1981. Frank Goldson was born in Carroll Co. LA, probably in what is now called East Carroll, near the Mississippi River. He joined the Louisiana Colored Infantry, sometime in 1863, and in 1864 was serving with Co. C, 47th Regiment, United States Colored Infantry. Frank Goldson's name is inscribed in the African-American Civil War Memorial in Washington DC. I haven’t checked, but probably these other men’s names are there too--or at least they should be. James Riley, 1844-1939, Co. B, 81st Colored Inf. Born Mississippi, enlisted in Louisiana in 1864. Died 20 Mar 1939. The story of his life, remarkable in many ways, can be see at "The Ellis Family." 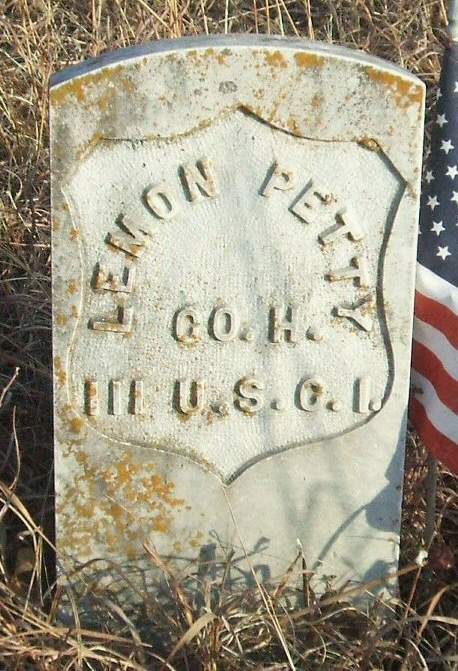 Lemon Petty, aka Clark Peddy or Petty, born Giles Co. TN 1825, died 24 Feb 1917. Served with Co. H., Illinois U.S.O.1. The Bureau of Land Management shows Petty homesteaded 14N-6E, which is S. Keokuk, where he was living in 1910, and explains his burial in Key West. Lydia Davis of Chicago State University wrote an undergraduate essay about about him and placed it on Ancestry. She now has an Ancestry tree and it gives the whole Petty family. As of August 2018 I am returning to this project and have found new data to be entered soon.